A nursery is a special place for parents and babies alike so it makes sense that its design aesthetic holds just as much appeal for the adults as it does for the sweet babes themselves. 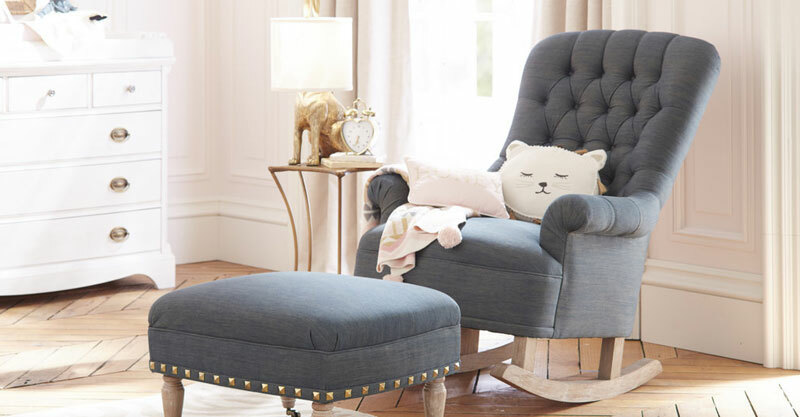 Pottery Barn Kids USA has us weak at the knees with their first ever nursery collection created in collaboration with renowned fashion designers and celebrity stylists Emily Current and Meritt Elliot. With more than 80 pieces of nursery decor in this exclusive collection, you’ll find bedding, lighting, storage solutions, furniture and decorative accessories that are full of charm, whimsy and a gorgeously refined colour palette. As young mums themselves, these designers have achieved just the right balance of fun, practicality and inspiration in this collection. Soft and pretty pinks have been made timeless with golden details and just a touch of their signature chambray. The chambray rocking chair nurses the balance of beautiful design and cosy comfort while layers of soft animal textiles seal the deal. Gold accents are aplenty with a fun gold cat hamper, gilded mirror, frames, garlands and a range of lights like this bunny lamp. If pink isn’t your thing then you still don’t have to resort to primary colours and standard character themes; check out Emily and Meritt’s black and white monochrome style. Bold and brilliant, this strong geometric theme is softened with texture and depth through exclusively-designed cushions, throws, bed linen and soft toys. The glam factor is then dialled right back up with hints of vintage gold, particularly with the arrow series of side tables, floor lamps and curtain hanging rod – I’m such a huge fan! Pore over this adventurous and endearing collection at Pottery Barn Kids USA. It is not currently available in Australia – we’ll let you know if there are plans to bring the collection to our shores – but they do offer international shipping if there is something you just can’t wait to own. In the meantime, inspiration awaits so get clicking.